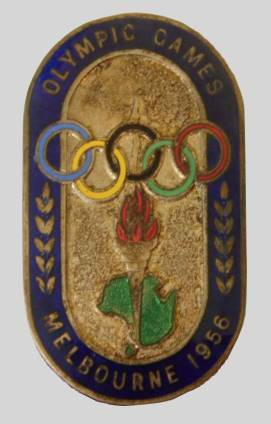 The symbol of the Organizing Committee was used for the badges, which were 2" x 1¼" in size. Coloured ribbon, appropriately stamped, denoting the category of the wearer or his sport was attached to each badge. Once again the principle was adopted of using the badges for souvenir and identification purposes only and not to admit the wearer to any venue. It was also decided that where a recipient, because of the positions he held, was entitled to more than one badge, he would be given the badge and ribbon corresponding to the highest Olympic position held. Numbers were estimated by referring to previous celebrations of the Olympic Games and by correlating these figures with the numbers expected to attend in Melbourne. In addition, every Australian sporting governing body provided a list of its officials and appropriate numbers were ordered. The number of badges ordered and issued are listed at the end of this report. In addition to the enamelled badges ordered, it was decided to provide plastic badges to distinguish lesser officials and interpreters. Thus 1,350 badges labelled "Official" and 500 with the designation "Interpreter" were provided. Recipients of plastic badges were not entitled to commemorative medals. Organizing Committee, Sub - Com.